We use only quality batteries for our own carts and retail the same brand and quality to our customers. We carry stock all year round and are ready whenever the need arises. Minnesota Golf Carts strives for quality and our customers needs as the #1 priority. We not only sell batteries, but service what we sell. 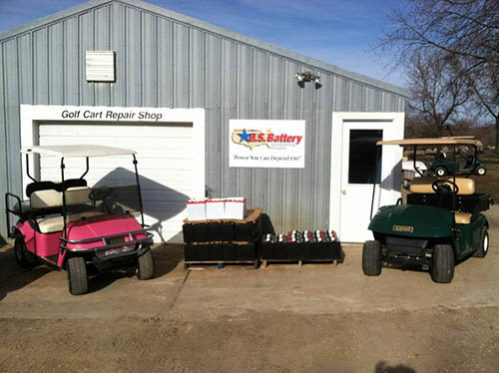 Our full service shop can install, maintain and diagnose all of your electric golf cart battery problems. We also make our cables in house to fit each application. All prices include exchange of cores. A new set of batteries should last 8 years or more, depending on the use of the cart and how well they are maintained. All batteries come with a one year full replacement warranty. Batteries are non-replaceable under the warranty if they freeze over the winter. We stress to our customers the importance to keep batteries charged and cables clean throughout the winter season. Below you will find a simple guide to insure that you will not have problems. 1. Check the water level once a month. 2. Keep the cables and connections clean. 3. Charge at least once a month, especially during the winter. 4. Do not leave the charger plugged into the cart during the winter, unless your cart and charger are designed for a constant charge. If you should have any questions, please feel free to call 1-507-642-3543 or 1-800-400-3946.